We all want a Xena movie so we can see how Xena got herself out of that whole dying thang at the end of A Friend In Need back in 2001. Alas the time for a Xena Movie has come and gone - well and truly. 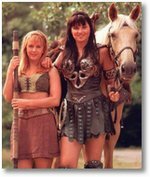 There are fans who have Xena Movie campaign going and petitions to TPTB and would love to see Lucy and Renee reprise their iconic roles but the truth is, it's not going to happen. A REAL Xena movie starring Lucy Lawless as Xena and Renee O'Connor as Gabrielle will NEVER happen. Unless something extraordinary happens in Hollywood, we will never see it. We may see a Xena movie with a 20 something unknown actress as Xena and a 20 something unknown as Gabrielle some time in the future. Not Lucy and Renee. Today comes the news that can only be put under "be careful what you wish for, you might get it" listing. - A Xena Movie is being planned. - They want a Lucy Lawless lookalike. good news (somewhat) so far right? Wrong. - It's a p0rn movie. I've linked the press release on the AUSXIP facebook page if you REALLY want to read the press release. There can only be one Xena and that is Lucy Lawless. There can only be one Gabrielle and that is Renee O'Connor NO ONE is going to ever replace Lucy and Renee. Unfortunately it will happen but AUSXIP won't be covering it. I'll stick with the originals and the best. If you REALLY want to know how Xena got herself out of that whole FIN problem...head on over to the Subtext Virtual Season and see how it's resolved.